Having graduated with a degree in social work from Millersville University, Brant Guilfoyle applied to Vista in 2006 after holding a supervisory position with a Lancaster County School District in their Before and After School Program. His natural talents and ability to make a difference with those on the Autism Spectrum was immediately evident during his interview, such that he was hired on the spot and started his career with Vista shortly thereafter on August 21, 2006. When waking up in the morning and thinking about the day ahead, Brant not only still looks forward to coming to work after more than 10 years of employment, but he also fondly recalls that this is where he met his wife, Jennie. In addition to growing professionally together over the years, receiving promotions to the Personal Care Assistant and Behavior Consultant departments, they have also grown their family with the recent addition of a 19-month-old daughter, Kiera. Although Brant commutes over an hour to work, he continues to come back day after day because of his personal commitment to seeing the students succeed. The immense pride he displays when describing some of his most memorable students transition back to their home district, in no small part because of his own influence and care of their intense needs, is nothing short of inspiring. Currently serving in a coaching and training role with a specialty in safety techniques, you’ll often catch Brant sprinting between buildings on The Vista School campus following receipt of an important crisis call on his walkie-talkie. 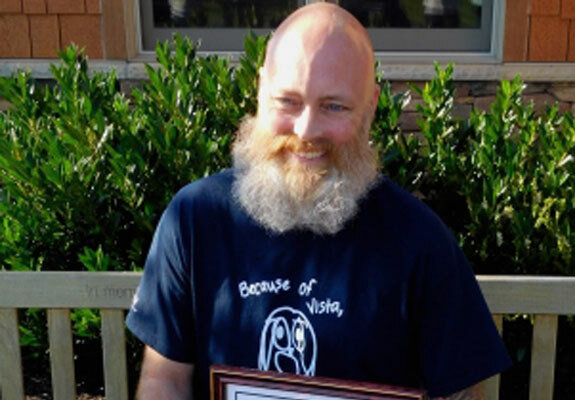 Additionally, with a true “whatever it takes” mentality, Brant also regularly supports Vista’s residential services department, where he provides services to some of his most challenging former students who have entered adulthood.